The new PROSTAFF P3 TARGET EFR is engineered for air rifle, 22 LR and other applications where the versatility of focusing on smaller targets at extended ranges—both close and distant—is needed. To facilitate this sharp focus at closer ranges, the PROSTAFF P3 TARGET EFR integrates an adjustable objective lens that allows the shooter to dial out parallax at any distance from 10 yards to infinity. 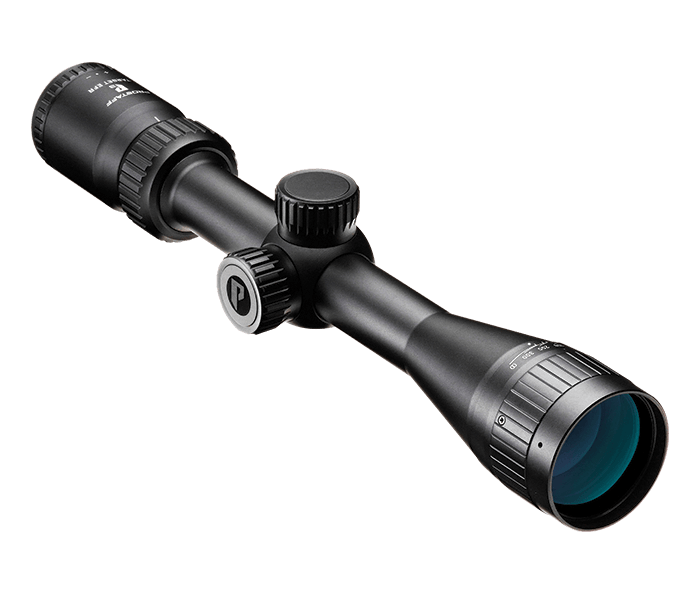 The adjustable objective lens allows sharp, parallax-free focusing as close as 10 yards all the way out to infinity. Designed specifically for air rifle and rimfire, the reticle creates a precise focal point without obscuring small targets. The Precision reticle draws the eye into the small dot at the reticle center. Reticle adjustments are made in crisp, positive 1/4 MOA click-stop moves that you can both feel and hear. Turret caps are all-aluminum construction for lasting durability. Spring-loaded windage and elevation knobs can be reset to 'zero' after sighting-in, for easy reference when making field adjustments. Windage and elevation turrets are clearly marked for quick adjustments.